I did an experiment a few days ago to see how easy it would be to get a number of profile pages indexed in Google. These profile pages included backlinks to one or two of my websites. I had a number of profile pages created for me about 3 months ago. Only a small percentage of these profile were actually indexed in Google. Any backlinks that you have on a page that are NOT indexed in Google will count for nothing. It’s important that you get as many of your profile pages (and articles and webpages!) indexed as possible so that those backlinks count! As you can see from the screenshot above, those 9 profiles were NOT indexed in Google. What I wanted to do then was see HOW I could get those pages indexed using the quickest and simplist method available. I took each of those URLs and bookmarked them using a website called Propeller. Each URL took about 30 – 60 seconds. This included writing a unique title and also amending the description. If Propeller pulled the ‘bio’ content from the profile I just shortened it and changed it slightly. Profile pages don’t have a lot of content on them at the best of times so I didn’t want Google to index this content on Propeller before indexing the content on my profile page. Propeller wouldn’t let me bookmark one of the profile pages as the site in question had been banned for spamming so I just indexed it using a site called BlinkList. After about 48hrs I imported the URLs back into my Index Checker app to see if Google had crawled and indexed any of those URLs. As you can see below Google had indexed 6 out of the 9 profile pages. This was ALL down to bookmarking each URL only ONCE using Propeller! The page that was bookmarked using BlinkList has not yet been indexed. What I am going to do shortly is take those 3 URLs that my app has added to the ‘Non indexed list’ and then bookmark them using a different bookmarking site. Then I will check in 2 – 3 days time to see if they are indexed. Many people build profile pages and submit articles etc and then spend time bookmarking them to numerous bookmarking sites as well as using other methods. My point is that if you find a couple of good sites that help get your pages indexed then you do not need to waste precious time bookmarking them to dozens of sites. If all it really takes is just ONE site to index your pages then why spend time submitting to lots of sites?! If you are working with a larger list of URLs then just use the process that I have outlined above. Simply run the URLs through my Index Checker app (or check manually in Google). Then copy and paste the non indexed URLs (generated by the app) into a txt document and save to your computer. Bookmark ALL of the URLs ONCE using Propeller or another bookmarking site that works for you. Then import the txt file containing the non indexed URLs into Index Checker a couple of days later and run the app again. You will hopefully see that a number of those pages are now indexed in Google. You can now forget about those INDEXED pages. What you need to do then is copy and paste the non indexed URLs back into the txt document overwriting the previous list. This list should now be shorter. Now go and bookmark these non indexed URLs using another popular bookmarking website. Then, same as last time, leave it a couple of days and run those URLs through the app again. Keep repeating this process until ALL your profiles (or articles!) are indexed! Remember, if you are actively building new profiles pages or submitting new articles then you can just keep adding these URLs to the list of non indexed URLs in your txt file. This is your working list and will always only contain URLs that are not indexed in Google. Of course there are many ways in which to get pages indexed. I will be testing lots of methods out shortly and will be sharing my results here. If you have any methods you’d like to share then PLEASE feel free to post a comment below. interesting post and i love the new app. Sure beats manually checking the URLS!! Don’t you think it is better to use a unique user name for each profile instead of the same one? Yes, ideally. I have tested all sorts. Where you can add your main keyword after your name but varying it is best practice. This is very interesting, i got some useful tips here, surely i have to possess a copy of Index checker, keep it up. I’m fairly new at this and find your tools very useful. I’m enjoying Link Checker and Article- Writer..and hope to jump into Link Abyss soon! Great tips on getting links indexed. I just pop a link on another site I own and ping that site. That seems to work too. have you tried the slingshot method? it is on WF, in a nutshell build a blogger blog, get the spiders visiting the blog constantly, and put your links there to get them indexed. Be interesting to see your results with this method. I have bought this method and have found no success with it. I can have the new page posted on my blogger blog in a matter of minutes it is indexed, but yet a month later the links are still not indexed in google. Not sure what to do different, but not happy with the slingshot right now. When you say the backlinks are not indexed but the pages are…. Google only shows a few of your backlinks. If a page is in Googles index then your backlinks will count. The strength of those backlinks though depend on many things which needs to be factored in. What I mean from the above. The blogger blog page is indexed quickly, but the links from the profile pages that I include on that page are still not indexed. I check them in the profile checker and nothing. Also checked the pages in the index checker and nothing still months later. So you are adding your profile URL’s to a blogger blog page? How often is that blog page getting cached? Feel free to email me a few example URL’s of your profile pages. Ifthey have little substance to them Google MAY not index them anyway. Not sure what you mean with regards to Profile Link Checker. That app will tell you if your links are present on a specific page and whether they are dofollow or now. If your pages do not have your links on them then they are no good to you anyway. 1. Access to bookmarking websites or any other useful for indexing purpose websites/services from inside the checker. 2. Save non-indexed URL list inside the checker to use it late on. Also it could be nice to save different list in different folders (e.g. by a niche name). *** I was looking at the bookmarking element of it but wanted to get this app out before Christmas.. so watch this space! With regards to your second suggestion I am looking into two different methods of storing the lists so hopefully this will be integrated shortly. It really pays off to check the indexing of your site, articles, etc. Looks like Index-Checker will be very helpful in getting more of your backlinks indexed, good job Andy! Great tool Andy. I purchased it the other day and will definately use. What tool do you recommend for social bookmarking? Excellent article I find jumptags works really well also. I have a really dumb question. If I’m hosting this on my server, can people that come to my blog use it? Or is it just for my use only? It’s for personal use only so you want to password protect the directory. I was happy to discover a lot of my web pages I thought weren’t indexed WERE indexed but I was suprised to see how many high PR sites I had that were not indexed. I will go a step further as after bookmarking the link, I will then ping it as well as turning it into a feed and submitting to a feed agg. It may be overkill but its quick and works very very well. Thanks, Andy for this useful tip. Keep up with this great work. Great info thanks andy. 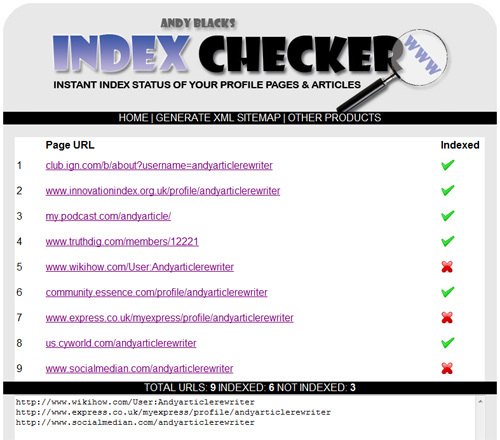 Im gonna give your index checker a whirl here and purchase it today. I always take my profile url’s and use html2rss to quickly mash them all into one rss feed and then submit that feed to the aggs. That takes care of indexing issues at least for the most part, though I am going to double check quite a few of my old profile url’s with your tool. ps-been using donahoes backlink booster recently and that seems to be just the ticket and then some for just this purpose. Thanks Andy for the example of how you use the checker / bookmarking. I am just starting to use your program to check my URL’s. Hmmm, great idea and I like the indexer tool as well. One of my favorite strategies include going to Yahoo Answers and simply answering a question related to my URL keyword or niche and voila, I’m indexed within a few hours. Even managed a Page One Google listing on a few times for brand new sites. Remember, Yahoo Answers have a PR of 8. Answer 2 or more questions with links to your new URL and you are A for away.